Whilst the Brexit process rolls on with ever more strident voices calling for different solutions, I am pleased to report that in one area, at least, the ties between the UK and our European partners are as strong as ever. Last month I attended my first meeting as President of UFEMAT, the European Association of National Builders Merchants Associations and Manufacturers, alongside colleagues from Austria, Belgium, Denmark, France, Germany, Italy, and Spain. The views expressed around the table made it clear that there is far more that unites us than separates us. With the exception of Italy, which has particular concerns affecting its business climate, the current state of trade across Europe is generally positive though not without its own challenges. Like the UK, our European neighbours are struggling to keep up with the requirement for new homes, due to a shortage of skilled labour and of some building materials. There is a heavy reliance on Eastern European labour in these markets too, and they may benefit if the UK becomes less open to migrant workers in the future. Digitalisation is another relevant issue across the membership. At one end of the scale there are a number of different systems with varying levels of integration in existence throughout Europe. We need to work towards a common format for building materials to be classified to provide a database that can be used within different digital applications. At a macro level we must also be aware of the competitive threat of global on-line retailers such as Amazon and Alibaba. The key to many of these issues lies in our ability to attract young people into the sector. One of the key objectives during my UFEMAT Presidency is to establish a European “Young Merchant Group” based on the success of similar groups in the UK and Belgium. Work has already begun. Both the current and ex-Chair of the Belgian Young Merchant Group visited the UK recently to meet with Knauf’s Jo Callow, BMF Young Merchant Vice Chair, and James Spillane, the BMF Regional Manager who administers our Young Merchant Group. Later this year, young merchants from the UK, Belgium and France will participate in a sold-out event in Toulouse, France organized by BMF Young Merchants and hosted by Knauf. While UFEMAT is sponsoring four young professionals from each member country with a €250 discounted rate for its annual conference in Montreux, Switzerland in October. My other core objectives include promoting best practice, with field trips for European wholesalers to the UK. The first trip took place in March with merchants from Spain and Portugal visiting E H Smith and Selco as well as the RCI Show. We hope to take a group of UFEMAT members to UK Construction Week in October, a great opportunity for them to see the latest products and innovations coming to market as well as arranging meetings with a wide number of building materials manufacturers. I’m a huge fan of exhibitions. Last month, for example, I attended ISH in Frankfurt. This is the largest HVAC and Water exhibition in the world with around 2,500 exhibitors. Over the course of three days I held meetings with over 20 BMF members who had stands there. 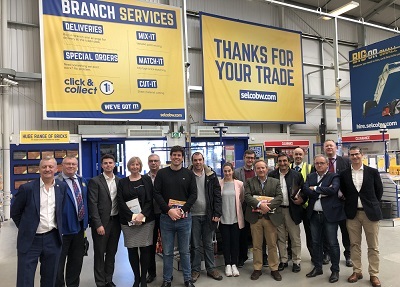 It’s a marvellous opportunity to do business but although the UK’s national P&H merchants were well represented, few independents had made the trip. I truly believe that they are missing out so for the next ISH, in 2021, the BMF and NMBS are looking to work together to take more merchants along and benefit from this excellent showcase. P&H is now the fastest growing area of BMF membership and we are fortunate to have Mark Bradley, MD of Plumbase, as the latest Chair of our Plumbing and Heating Forum. He is already introducing new ways of engaging with P&H members. For example, running two Forums – one for those in the North and one for those in the Midlands - in the same week. This proved a great success with 66 members able to attend one of the meetings. The views of members at P&H Forums will also help the BMF provide industry input to the anticipated government consultation following the announcement by the Chancellor of their intention to adopt recommendations made by the Committee on Climate Change, which backed low-carbon energy sources for heating new homes by 2025. By working together we are not only stronger, we can make sure that our sector’s voice is heard. Whilst the Brexit process rolls on with ever more strident voices calling for different solutions, in one area, at least, the ties between the UK and our European partners are as strong as ever. Is your driver training up to standard? It is difficult to believe that Driver Certificate of Professional Competence (DCPC) has been with us close to 10 years. In an age where we are experiencing dramatic changes in technology within trucks, truck maintenance, operational and cost control, it is disappointing that little change has been seen in terms of mandatory change to DCPC and driver professional development. Perhaps Earned Recognition and accreditation schemes such as FORS will influence change. The industry experienced a “pinch point” in 2014 with many drivers and operators leaving the 35 hours within 5 years (2009 to 2014) to the last minute. Training providers were under pressure, operators, including builders merchants, were under even more pressure as many older drivers did not wish to be trained after a lifetime in the business. This compounded the already serious driver shortage. The BMF Apprenticeships Plus service has introduced a new LGV Driver Level 2 Apprenticeship to help merchants overcome this shortage. While this will undoubtedly help merchants to future-proof this area of their operation, they must continue to support their existing drivers and ensure their training, and DCPC, is up to date. Despite the warning signal in 2014, the 5 year cycle for current card-holders to complete their next round of DCPC training ending in September 2019 is already showing the same symptoms indicating there will be another last minute rush to achieve the required 35 hours training.This suggests that some operators have either lost faith in DCPC or alternatively are not interested in investing in their major assets – drivers. Criticisms can be heard of DCPC including - “you can take the same modules five times, or you can sit there for seven hours, stay awake with no involvement and qualify for the hours”. These arguments can be easily answered by planning and completing annual training, recording the module subject / content completed by driver and following up DCPC the following week by some form of internal competence tests. User friendly IT based / app solutions to assist with this process are available from Prompt Training, who provide the BMF’s Transport Plus service. Another frequently heard “observation” from both drivers and operators relates to the volume and type of legislation, rules, codes of practice and red tape. It is probably no different in real terms in any industry be it accountancy, manufacturing or the food industry. Again, this can be partially answered by comparing UK statistics for fatal and serious injuries with other countries suggesting our road safety record is good. The counter argument is that an average of 5 deaths, 68 serious injuries & 395 slight injuries on our roads every day points out that we have room for improvement. For it to be effective, driver training needs to become more user friendly. Seven hours in a classroom may seem too long, particularly when compared with the average university lecture. However, despite all the lobbying and posturing the existing legislation is likely to remain unchanged for a considerable time, so we need to make the best of it by using it as a platform to develop our drivers and make the profession attractive. Similarly, asking a driver to listen to a tool box talk at the end of a shift or on a Friday afternoon is hardly going to generate enthusiasm and achieve the desired information intake and retention. Just as obtaining a signature on a method statement or site rules won’t be effective without a supporting explanation or knowledge test. Operators expect a lot from drivers, in fact most spend a relatively small proportion of their time actually driving. So much so that perhaps “LGV Driver” as a job title should be reviewed, which may also encourage greater interest amongst younger people in the role. In the meantime, planned training for existing drivers, coupled with competency checks / audits should be a regular feature of a professional operation with a positive desire to protect their workforce, the general public and their business. This article was produced with assistance from Prompt Services, who provide BMF’s Transport Plus service. If you would like to find out more about driver training, and how BMF Transport Plus could benefit your business, please contact Prompt Training at sales@prompttraining.co.uk or 01773 850428, quoting your BMF membership number. In an age of dramatic changes in technology within trucks, maintenance, operational and cost control and driver shortages, the BMF has introduced a new Apprenticeship to help merchants overcome qualified driver shortages. In line with its ambition to encourage life-long learning throughout the building materials industry, the BMF is gaining independent accreditation for its training courses through the globally recognised CPD Certification Service. Being accredited means that the learning activity has reached internationally-recognised Continuing Professional Development standards and benchmarks, and that the learning value of each course has been scrutinised to ensure integrity and quality. Three BMF courses, How a House is Built, Managing for Success and Measuring Building Quantities, have been CPD accredited to date with more due to follow later this year. The first three CPD accredited courses are designed for merchant staff at various stages of their career. Anyone completing a BMF CPD accredited course will receive a formal CPD certificate of attendance stating the number of CPD hours attained. This benefits not only the individual by providing evidence of professional development, it will also help managers to maintain up-to-date training records and ensure that all members of staff are supported in developing skills and adapting to changes in working practice throughout their careers. Encouraging life-long learning throughout the building materials industry, the BMF is gaining independent accreditation for its training courses through the globally recognised CPD Certification Service. Rainy Day Trust CEO Bryan Clover talks about the rewards of helping others and how you can support your industry charity. If you love your job then getting up each Monday morning is something to look forward to, rather than a chore. I’m lucky, I work in the charity sector and each and every day I can go home knowing that I’ve made a difference to someone’s life. That is incredibly rewarding. Perhaps we have helped them through a difficult patch or problem. Maybe we have given them the tools to get a better job or even get back to work after being made redundant. For a lot of people, work is a means to an end, it pays the rent or mortgage and keeps food on the proverbial table. At the Rainy Day Trust, we have a number of firms that are business partners and we work closer with them to support their staff, and also to give those same staff members the chance to give something back for the benefit of their colleagues. Many people help charities or even set ones up after the loss of a loved one. For me, at face value, there are two very simple reasons why I work for a charity and then set one up in my daughter’s name after she died; firstly, I set up Evie’s Gift to make sure that Evie’s name lives on long after I have died, and secondly, because for both work and Evie’s Gift, nothing beats the feeling you get when you help someone else. But underneath that was a more fundamental need. A need to help, be needed, to regain that purpose in life once again. Nothing helps like helping someone else. Setting up a charity is a pretty extreme step to take, involves an incredible amount of time and work and there are so many other simpler ways that you can help others. You could fundraise for a charity that has been involved with you, look out for elderly neighbours, do a beach clean looking for plastic, do litter picks or volunteer your time for any one of 167,000 active charities in the UK. It’s one of those dreadful clichés to say it’s ‘giving something back’, but the act of selflessness does help us through a dark time or can help us to make sense of our place in the world. You never know, one day you might need that help from someone else. For me, being needed is central to who I am, who I want to be. On Christmas Day we volunteered for Bath Churches Open Christmas all day, serving a Christmas meal to people living alone and those who are homeless. The gain for us was that we didn’t have to think about Evie not being there for our first Christmas without her, we just got on with the job, and then went home to chicken fajitas and a decent bottle of wine. Supporting charity doesn’t always have to be about donating money – although all charities need that too. Every day the news is full of stories around Brexit, the uncertainty that it is causing and new job losses or companies struggling to survive. I live near Swindon and the town is reeling from the news that Honda is to close the plant in 2021. Since Christmas we have seen a number of well-known home improvement firms go under with thousands of jobs affected. The Rainy Day Trust is supporting both the firms and the staff affected by the risk of redundancy. I’ve said it before and I’ll say it again, we don’t have an endless pot of money to dip into, and we constantly need people to help us help others. So how about being an ambassador where you work? Do something for someone else! Run a small event for us to help fundraise, make your work colleagues aware of how we can help them if they need us, or just be there when someone needs a shoulder to lean on. Whatever you do, helping someone else will give you a lift, so why not give it a go? It doesn’t have to be much, and whatever you choose to do for someone else, it will feel good. A classic win-win. Enjoy the rewards of doing something for someone else! Run a small event or just be there when someone needs a shoulder to lean on. Whatever you do, helping someone else will give you a lift, so why not give it a go? When operating in a competitive environment, like a builders merchants, saving time and money can be crucial for your success. Thanks to over a decade of health and safety experience within the merchant industry, Southalls not only understand the key to compliance, they frequently spot opportunities to cut costs on unnecessary safety expenditure. The Control of Asbestos at Work Regulations require merchants to assess and manage the risk of asbestos. This is achieved through the undertaking of an asbestos survey and complemented by an asbestos management plan. There is no legal requirement to re-survey on an annual basis, only to review the survey and management plan you have in place. Occasionally we come across merchants paying for independent Legionella water sampling, system cleaning or testing of water temperatures at taps on a rolling contract. If you operate on a domestic scale system then this expenditure is completely unnecessary. Portable appliance testing (PAT) is an essential part of electrical safety for business merchants. However, it is a myth that portable appliance testing is a strict legal requirement or that it needs to be undertaken annually. Many merchants waste money on a blanket approach of annual testing. Whilst items that are in heavy use or exposed to the elements e.g. portable hand tools may require a six monthly PAT, office based equipment like desktop computers and screens would only require five yearly testing (2-4 yearly visual checks) and no testing at all if double insulated. E-learning training is a cost-effective and time-saving solution for staff safety training. Whether for day zero induction training or ongoing refresher training, Southalls E-learning on Safety Cloud ensures staff get up to speed on essential safety training such as fire safety awareness and manual handling without the time and expensive of face-to-face training providers. Further merchant specific training including, racking awareness, work at height, powerline safety, workplace transport and banksman training can all be conducted through Safety Cloud. When it comes to saving on health and safety, buying items in bulk can help. However all purchases must now be compliant with the new PPE Regulation (EU) 2016/425. PPE suppliers who are members of the BSIF Registered Safety Supplier Scheme demonstrate a commitment to compliance with the new Regulations. Purchases need to meet the new standards, otherwise you are throwing money down the drain. It is also important to consult staff on sizes. It goes without saying that poorly fitted items will either not be worn or may even increase the risk of accidents. A number of merchants have seen reductions in lost time accidents through the provision of gloves to all yard staff, reducing hand injuries. Avoiding unnecessary examinations of lifting equipment is a quick way to save money, so every business-owner should understand which reviews are legally required, and which are not. Pallet trucks are not defined as lifting equipment under the Lifting Operations and Lifting Equipment Regulations (LOLER) and therefore they do not require a thorough examination. Sometimes thorough examinations are duplicated by both an insurer and another service provider. Thereby unnecessary doubling of cost. Where pedestrian lifting cages are used with a forklift, nominating designated forklifts to be used with the lifting cage that are then thoroughly examined six monthly is more cost-effective than simply thoroughly examining all lift trucks on the site every six months. Remaining trucks can be thoroughly examined annually thus saving the cost of an engineer needlessly examining fork lift trucks. Finally, recent HSE reports reveal that annually UK businesses loose £15bn due to work-related injuries and ill health. It is important to regularly review the accident and injury statistics in your business. This is an invaluable way to build a picture of the effectiveness of your risk management and help you to make more informed decisions on how to spend your health and safety budget wisely. Southalls specialise in helping builders merchants stay on top of their health and safety legal requirements, keeping their staff and customers safe, and their businesses compliant. For information about the BMF Safety Plus service or to discuss any health and safety matter, please get in touch with the Southalls team on 0345 257 4015 or hello@southalls.com BMF members can also request the following BMF H&S Business Guides from Richard.Ellithorne@bmf.org.uk – Work at Height; Deliveries to Customer Sites; Workplace Transport; Material Storage and Handling; Saw Mills and Wood Working Machinery; Overarching Guide; Occupational Road Risk. As a member of the most recent intake of students in its in-house Sales Management programme, Howarth Timber & Building Supplies’ sales graduate Paige Blanchard is keen to encourage other young people into the industry. 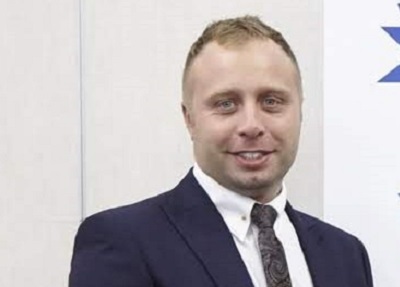 Since joining the merchant industry, my career has gone from strength to strength in a short space of time, with great development opportunities such as the sales graduate course I’m participating in, as well as hands-on learning at the Doncaster branch. I’ve experienced challenges such as the vast product range to learn and understand, but I’ve been fortunate to have worked with a number of supportive people as I familiarise myself with the industry. As with any industry though, there’s always room for improvement in terms of how we promote ourselves and the industry to the next generation. It’s really interesting to hear from other young people on the Howarth graduate course as well as in the wider scope of the industry. We share a lot of the same goals and challenges, and it’s always interesting to hear the experiences of the speakers at conferences and trade days, discussing different aspects of the industry and how it has changed over the years. The sector as a whole is still quite slow to adapt to change, and it’s important that we challenge this to make sure we’re always at the cutting edge and able to change with customer needs. One of the consistent points of discussion is the lack of young people – particularly women – in the industry, and the need for this to change. It’s a really rewarding industry to work in, so I’m passionate about changing this. For me, the opportunities available to train and develop new skills is particularly inspiring – you definitely need a wide skill set to make the most of opportunities and I plan to use my own experience to inspire others. I feel the key to motivating other young people is all about having the right mindset to drive a business forward – I believe that anyone with this ethos, regardless of age or gender, can have a successful career in this sector. As an industry however, more needs to be done to encourage young people with the right mindset, particularly young women, to take up careers in merchanting. I believe there are three key ways we can do this: education, media and visible role models. Through education, stereotypes of merchanting and those who work within it can be challenged – if we teach children to challenge old-fashioned stereotypes from a young age, they’re more likely to break the mould as they get older, seeing careers in construction and merchanting as real, viable career options. Businesses within the merchant industry could also take opportunities to visit schools, colleges and universities to discuss the attractive and varied career opportunities it provides. The media, particularly social media, should play a vital role in encouraging young people to join the merchant industry; after all, they absorb it every day. I don’t feel social media is utilised as much as it should in promoting careers in the industry, and this is something that could easily be changed. By making the merchant industry more visible on social media – the responsibility of both businesses and employees – young people will begin to view it more as an exciting career option. The use of various forms of media should be promoting the merchant industry to young people, not just through making it more visible, but specifically by making role models visible. Young people need to see other young people with successful careers within the merchant industry in order to encourage them to pursue a career themselves. The younger generation don’t see their peers in the sector due to the current underrepresentation, so it’s important to utilise those who do currently work in merchanting through making them visible – whether that’s through social media, television or education. As an industry, merchanting is exciting and fast-paced, offering real challenges and real rewards. I look forward to seeing how we can push this forward and encourage more young people to join us. For more information on Howarth Timber & Building Supplies, visit www.howarth-timber.co.uk or search for Howarth Timber on Twitter, Facebook and LinkedIn. As one of the most recent intake of students on the Howarth Timber & Building Supplies Sales Management programme, sales graduate Paige Blanchard is keen to encourage other young people into the industry. Two weeks after I passed my driving test, I found myself standing on the driveway, explaining to my father how I’d managed to not only drive into the back of someone earlier that day, but I’d also just ran into his garage wall. Dad maintains the first thing he did was calmly explain that you don’t really learn until you are ‘doing the do’ and this was all part of the learning experience. Trust me – it was far from the first thing he said but once his blood pressure returned to normal, he did indeed say it. I often think of this when asked ‘why do an apprenticeship?’. My wonderful (and very patient!) driving instructor gave me the tools and techniques to drive, but it was only when I was actually driving day in and day out, that I truly learnt to apply them. It was a similar experience entering the workplace after three years of University. One of the many benefits of an apprenticeship is that the training you receive is not only relevant to your exact role and industry, but it is also put into practice immediately. No waiting to pass a test or graduate or find a job, you simply learn and apply in real time. A sure-fire way to get you on the right path within your chosen career. The other bonus is that, unlike driving lessons or University, you don’t have to pay for your training nor complete it in your own time. The Apprenticeships format was designed specifically to be accessible to all and to achieve this, study time is protected within work hours, and financial barriers are removed. No late-night study sessions or tens of thousands of pounds of student debt here! Often when I explain to people that there is a way to learn whilst being paid, and without incurring huge debts, they believe that there are only entry level apprenticeship qualifications available. Absolutely not true. Apprenticeships now go all the way to Level 7. Chartered Accountant, HGV Driver, Master of Business Administration (MBA), Chartered Manager, Team Leader, Digital Marketer, Health and Safety Technician, are just few of apprenticeships out there. Builders' merchants are a hidden gem for Apprenticeship opportunities. Often overlooked, they offer an array of career pathways including those listed above. The very nature of the industry means that those working within it need to be at the forefront of exceptional customer service. As well as the formal apprenticeship training, Builders Merchants also invest heavily in additional training of their apprentices in the form of online learning, short courses and supplier training, all of which run alongside the formal apprenticeship. During National Apprenticeship Week, I urge all of you who are seeking a solid career pathway with significant opportunities, to consider an apprenticeship with one of the many members of the BMF. If ever you needed proof that “doing the do” works, this formally dodgy driver now oversees the BMF Apprentice Driver Program. During National Apprenticeship Week, Carmen Daley of BMF’s Apprenticeships Training Agency explores the merits of undertaking an apprenticeship. The BMF’s annual Remuneration Survey covering the 12 months ending April 2018 provides some interesting insights into the merchant industry. One of the most positive is a huge leap in the number of apprentices employed. The BMF has undertaken its annual Remuneration Report, showing salaries, wages and benefits paid to builders’ merchants’ employees for a number of years. Most of the financial information is shared exclusively with BMF members. However, two years ago three new questions were added to provide greater insight into gender diversity, youth recruitment and employee churn rates. With a second year of data to hand we are now able to track progress in these areas. The greatest change is seen in the number of apprentices employed by builders merchants. Nationally, apprentices made up 7.45% of the total merchant workforce at 30 April 2018, a significant increase from 1.12% reported in 2017. This is particularly interesting as it contrasts markedly from the apprenticeship trend across all UK industry, where the number of new starts fell dramatically following the introduction of the new apprenticeship funding system in May 2017. Whilst some found the new funding system challenging, the BMF embraced the opportunities it has afforded. Firstly, by forming an accredited Apprenticeship Training Agency and launching BMF Apprenticeship Plus, which removes potential administrative hurdles making it easy for BMF members to take on apprentices in any job role. In addition, along with the Electrical Distributors Association, the BMF championed the development of a new, industry specific Trade Supplier Apprenticeship Standard - the first developed by our industry for our industry. Launched earlier this year, it is already on course to become the merchant sector’s primary Level 2 qualification. We have not analysed why merchant apprenticeship numbers have risen so dramatically, but the increase in the number of relevant apprenticeship standards coupled with BMF’s administrative support services may well be a factor in encouraging more merchants to recruit apprentices and upskill staff. The 2017 survey uncovered a wide disparity between the number of men and women working in the merchant sector, an 85:15 male:female employment ratio. The 2018 data results showed a small improvement to a ratio of 81:19 male:female. This was largely driven by the results in London and the South East, where women now account for around 25% of merchant employees. Before we start celebrating, we should bear in mind that women currently make up 47% of the total UK workforce. Women are significantly under-represented in the construction industry as a whole, yet it is still surprising that the gender gap is so great in merchanting, which is essentially a service industry. One possible reason is that many women don’t imagine themselves in any aspect of construction in the first place, so don’t apply for jobs in merchanting. It is down to the industry to make itself more attractive to a wider cross section of the population, possibly by offering more flexible contracts. This is an area that we will be looking at closely again next year. Employee churn can be seen as a positive indicator. Voluntary labour turnover rates can be a reflection of growing confidence in both the UK’s economic performance and employers’ optimism in recruitment. However, if the churn level becomes too great it can lead to skills shortages, which is why we need to encourage more young people, both male and female, into the industry. In particular, we must do more to change women’s perceptions about the industry. The BMF is doing this in our Youth Employment campaign, which features a number of female role models, but more action throughout the industry is clearly necessary. The BMF’s Remuneration Report is one of many business reports and services provided to members, who include both merchants and their suppliers. To find out more about the full benefits of membership and how to join the BMF click here, email: info@bmf.org.uk or phone us on 02476 854980. While change has always existed, it does seem that we are currently living through a time of tremendous uncertainty. Our reaction to change is frequently negative. People fear the unknown and such uncertainty breeds unrest. A clear example of this is the deep division between those who think the UK is best served by leaving the EU, with or without a deal, and those who are equally convinced that we must remain in order to prosper. In our own industry, we may fear the consequences of a collapse in consumer confidence as Brexit continues to dominate the headlines. If consumers are not spending, what will be the effect on our businesses? Will investors think they are worth investing in? Is there any point in hiring and training staff if we have to lay them off down the line? Entire economies can be stifled at times of such uncertainty – often needlessly. It is not possible to stop the future from changing, but if we understand why and how it is changing, we can not only protect our businesses, but even give them a competitive advantage. The key is having access to accurate data. The BMF has been working on a new forecasting model for the building materials supply industry for some time. Our Builders Merchants Building Index (BMBI) uses data analysed by research company, GfK, to report on actual sales category performance. While this has enabled users to see which products and regions are currently growing, we have now gone a stage further to meet our industry’s need for accurate forecasting. Most forecasts tend to be based on lag indicators. Essentially, they use what happened last year to predict what could happen next year. The BMF model incorporates a number of lead indicators to signal future events that will impact our markets. Using the BMBI data coupled with advanced modelling techniques we have developed a channel specific forecasting model to show what is likely to happen in the next 12 months, making it possible for merchants and suppliers to forecast their customers’ requirements more accurately. Our new forecasting model is just one example of the BMF helping its members to Build Excellence in their business. Our latest member survey confirmed the value of other services and support offered by the BMF. An overwhelming majority, 98%, find the BMF both member-focused and member-engaged, whilst 95% agree we are passionate about adding value to members’ businesses. The survey also confirmed the major factors affecting BMF members’ business over the coming year. Not surprisingly the B-word sits at the top of the list, closely followed by related concerns such as the economy, the availability/supply of products, price increases, together with skills and recruitment issues. In times of economic uncertainty, it is more important than ever to ensure that your business has access to accurate, relevant, timely and impartial information as well as regular points of contact with colleagues in your field. All of which enables you to build a 360o picture of the market to help you make the right decisions for your business. What a great year 2018 was for the BMF celebrating 40 years since its formation and 110th year as a Trade Association. The year provided a number of fabulous events to mark the special occasion, one of which saw the BMF Young Merchants host their very first Young Merchants Conference. The event was held at the NEC during National Construction Week in October and proved to be a great success attracting 150 delegates from current, past and potential Young Merchant members. I was honoured to have been voted by my peers to take on the role of Chairman for the Young Merchants Group at the Young Merchants Conference and I am really looking forward supporting the group over the next few years, to continue the great work that has been done in raising awareness of the group and the opportunities it can provide. I’m also delighted to have Joanne Callow from Kanuf Insulation on hand to help in her new role as Vice Chair of the group. 2019 is now in full swing and we are looking forward to our first meeting of the year which will be held at The Talasey Group in Doncaster. We will be taking advantage of their new purpose-built academy and attendees can expect to be part of a very practical meet, designed in a way that is hoped will provide everyone the opportunity to take something away that will improve their understanding of leading a highly successful team. We are expecting good attendance at this meeting and hope to officially welcome some new Young Merchants following their involvement in the conference last year. We are thrilled to be able to announce that Knauf have kindly sponsored our International Trip for 2019, one of the highlights for this coming year for the Young Merchants Group. The trip will see a delegation of Young Merchants head out to Toulouse to visit Knauf’s manufacturing facilities as well as calling into local builders merchants to see how they operate. Whilst the meeting and trips are important educationally and are networking opportunities; there is a much greater purpose for the next generation of the industry that we hope the Young Merchants Group can influence. Youth recruitment is a key area of focus for the BMF in 2019, it is crucial that we attract new talent into our vibrant and diverse sector. I have hopes that the Young Merchants can be ambassadors for the Industry to showcase the many benefits there are to be had in the Building Materials Supply Industry. Another ambition is to foster greater ties with European Builders Merchants. Despite the uncertain geopolitical times ahead with Europe there is no reason why we cannot unite our European counterparts through UFEMAT which is building stronger ties with the BMF. The opportunities to network and collaborate with these businesses will surely be a benefit, when looking at efficiencies and best practice in our respective roles. All in all, there are lots of opportunities and challenges ahead in 2019 and I look forward to the BMF Young Merchants having a helping hand in the progression of our sector for years to come. If anybody would like to apply to join the Young Merchants please visit our Young Merchants page or contact james.spillane@bmf.org.uk to apply and he will be happy to help. New BMF Young Merchants Group Chairman Glenn Paddison (of MKM) talks about plans for the Young Merchants Group over the coming few years. Where does my Rainy Day Trust donation go? Who benefits or is it just gathering dust somewhere in a bank account? I get asked those questions all the time and they deserve an honest answer. There was a time when the Rainy Day Trust focussed solely on grant-making, either one off grants to meet an immediate need, or ongoing grants to help people over the longer term. When your washing machine breaks and you can’t afford a new one, we can replace it, but if your kids need school uniforms a few months later you still won’t be able to afford them because the underlying problem hasn’t changed; you still can’t afford them because you don’t have sufficient cash. What we do now is deliver a series of programmes of support that aim to tackle that underlying problem and help you to help yourself. How much money you have is a double-sided coin – you either need to earn more or reduce what you routinely spend. We help people do both of those things. We can help you earn more by upskilling or re-training you. We can pay for courses or help you with CV writing, to make your application that bit better than the other guy’s. We help apprentices during their training and improve pass rates, giving them a skill for life. To reduce your outgoings we can offer you free debt advice, which will help you re-schedule your debt making it more affordable; importantly it can help prevent bankruptcy which can have a massive impact on your future potential – try getting a mobile phone contract when you’ve been made bankrupt or have a CCJ against you. Our winter fuel package not only pays £250 direct to your energy supplier so that you can go into the winter knowing that you can turn the heating on, but it also pays for a boiler and heating system service and installs a corrosion inhibitor. This can reduce your heating bills by 10-15%. The housing advice, free counselling and free legal advice can reduce the stress and anxiety that you may be feeling and so reduce the risk of pressures at work, so making you more ‘employable’ because you are in a better place mentally. So what does your donation buy? £35 pays for 5 telephone counselling sessions, £50 pays for an hour’s legal advice, £80 buys the school uniform for a child, £120 a new fridge, £300 a new washing machine, £460 a new laptop and MS Office for an apprentice. £1,200 pays for the annual license of our welfare benefits checker that helps hundreds of people every year. But that just talks about what we can offer, not what we actually spend the money on. Each and every year we help hundreds of home improvement employees, past and present, through all of our programmes. Last year we helped one man who had lost his wife at a very young age. We were able to help with new white goods and school uniforms, debt advice, bereavement counselling and much more. Another applicant asked us for help with rent arrears which had built up because of long-term illness. By intervening with the landlord we literally got the keys back as he was being evicted. We kept the roof over his head. A young lad had left a young offenders’ institution and while in there had discovered that he had a talent for carpentry. We were able to buy him a set of tools so that he could practice at home for his apprenticeship and now according to his mentor he has turned a corner because he loves what he does. But just like your personal money, what we don’t spend the donations on is just as important. We DON’T waste it on swanky London offices and huge rents. We don’t have a massive staff to pay salaries for – there are now three of us, one full time, one on 4 days a week and our new Fundraising Manager on 3 days a week. We don’t spend a fortune on marketing and advertising because we work closely with the trade publications to get free articles whenever we can. This year, once again, we will be running a budget deficit because the number of people that we help is growing rapidly – we spend three times as much now on helping people as we did three years ago. And we expect that growth rate to continue. Which, in turn, means that we have to be even cleverer when it comes to saving money and raise more to meet the need. There’s the rub – MEET THE NEED! Not want, need. I’ve said it time and again – having to make a choice about whether you heat your home or eat is something that simply shouldn’t happen in 2019 Britain but it does. I have seen homes where there is ice on the INSIDE of the windows in the morning because it is so cold. This person wasn’t lazy, or drinking. They were in their eighties and were desperately trying to survive on a pathetic pension. But don’t worry, it’ll never happen to you, will it? Contact the Rainy Day Trust on 0203 192 0486, via www.rainydaytrust.org.uk or info@rainydaytrust.org.uk. Bryan Clover, CEO of the Rainy Day Trust, explains how crucial funding our industry charity is - who benefits and how the money is spent, such as RDT support programmes. Online learning is a powerful and cost-effective way to take in and retain a large amount of information, making it well suited to product and technical training. Some 80% of merchant staff in the UK have access to online learning systems, which are used to build skills and knowledge. The BMF’s latest training offering, which can be delivered either via BMF Campus of via the merchants’ own Learning Management System, will add significantly to this knowledge base and will be accessible from work or from home. The new BMF Building Blocks series is an online training programme designed to replace the MOL distance learning workbook series which was retired in 2018. While MOLs had their day as a popular learning form, they had dated both in terms of content and mode of delivery. This provides the BMF and their e-learning partner, Cortexa, with an excellent opportunity to create new rich media content and to collaborate with BMF’s supplier members to ensure the latest technologies and techniques are included in the programme. The Building Blocks series is designed to introduce apprentices and other new starters to the intricacies of life in a builders’ merchant. It starts with foundation blocks that cover planning, regulations and structural products, moves on to further blocks that cover key product groups and ultimately builds into a comprehensive guide to the industry and products stocked and sold by every type of merchant. Each multi-media training Block combines a range of video, animations and interactive content to bring the subjects to life. The content is further reinforced with programmed learning in the form of downloadable reading/reference material and weblinks. Each e-learning Block includes knowledge checks and practical coursework and is completed with a final assessment. Successful completion will earn credits for the learner towards an online Award. Cortexa is an approved centre for Occupational Awards and within two years BMF Building Blocks will be a fully accredited online programme that will define the standard of product training in the merchant industry. Twenty new e-learning Blocks or units are planned for introduction during this time and by the end of 2019, there will be sufficient Blocks available for students to combine to create an accredited Merchant Award, whereby candidates have to complete at least 4 Blocks and pass a final exam to achieve the standard. An Introduction to Residential Construction Part 1: Covering planning, regulations, groundwork and the masonry elements of house building. This Block is sponsored by the Concrete Blocks Association. An Introduction to Residential Construction Part 2: Covering timber in construction, joinery basics, roofing and fixings. This block is sponsored by the TTF and a number of Supplier Members. Heating and Hot Water Comfort: Covering Central heating principles and design, regulations, heating and environmental controls, hot water storage and renewable energy sources. Sponsorship packages for this Block are available. Phase 1 will be completed with Building Blocks on Below Ground Drainage, Buildings Insulation, Cement and Plaster and Customer Care. Phase 2 will comprise units on Bricks and Mortar, Doors, Windows and Stairs, Landscaping, Underfloor Heating, Roofwork, Above Ground Drainage and Bathrooms. Phase 3 will cover Aggregates and Blocks, Lightside Materials, Tube Fittings and Flanges, Plastic Pipes and Components, Plumbers Brassware and Commercial Practice. One of the biggest challenges with any training content is keeping it up to date, so the Building Blocks programme aims to future proof the content by forming partnership groups and sponsor opportunities for BMF Supplier Members looking to get involved. BMF training ranges from formal Apprenticeships and sector-specific Diplomas, Degrees and a Masters Degrees in Merchant Leadership and Strategy, to on-line product knowledge and other specialist skills training. Online learning is a powerful and cost-effective way to take in and retain a large amount of information, making it well suited to product and technical training. The BMF’s latest training offering will add significantly to this knowledge base. Why do we struggle on in silence when simply reaching out for help can make a world of difference? Is it stigma? Is it pride? Is it a bloke thing? It doesn’t really matter why, it matters because the effect of stress and anxiety in their various forms has a huge impact on our lives, and as importantly on our livelihoods. On your livelihoods. The big problems like PTSD, bipolar disorder or ADHD grab the headlines, but it’s good old-fashioned stress that is most widespread. The pressure of work, family problems, bereavement, finding sufficient work all add up to a pretty unhealthy atmosphere. If our brains are diverted from the day job, we don’t function properly and our work is affected. That can lead to some pretty one-sided conversations with managers which, ironically, just make everything worse. We start worrying about losing our job which can be incredibly self-destructive. It rapidly becomes a vicious downward spiral. Let me give you a very personal example, drawn on my own experience. In October 2017, our 13 year old daughter started getting headaches. We took her to the doctor and they told us not to worry as it was just puberty-related migraines. We went on holiday to Spain. Twelve hours after arriving we were in A&E. Eight hours later we were in intensive care, and a few hours after that they did an emergency operation to save her life to remove part of a massive brain tumour. Fast forward through a month in the Bristol Royal Children’s Hospital, and 6 weeks at home, and Evie died on 11 Jan 18. The emotional trauma that we went through, and are still going through, has led to an enormous amount of stress. So much so that many months later I am still not functioning properly; my brain is constantly questioning what happened and asking ‘Why?’. I’m exhausted all the time and don’t sleep. Now what that leads to is without the support of our GP and months of counselling, I wouldn’t be functioning at all. It affects work, home life, everything. But I recognised early on that something was wrong and asked for help. All you have to do is ask. The Rainy Day Trust doesn’t just give financial support, although that in itself can help alleviate those money worries, especially if you are ill or off work. We can also offer free telephone counselling, free debt advice, an hour’s free legal advice, housing advice and support for those affected by cancer. From a mental health perspective, arranging a face to face counselling session can be difficult fitting in with work commitments, so telephone counselling is really flexible. We give 5 free 30 minute sessions over the telephone. If at the end of that you want more, just ask. Or if you need face to face counselling we can pay for that if you can’t afford it or can’t find a charity that can give it locally. So take it form me, you don’t need to keep a stiff upper lip. You don’t need to bottle it all up and pretend the problem doesn’t exist, because you know what? If you do, it’s going to build up and bite you in the backside sometime sooner or later. Tackle it now and get your life back. Take it from someone who has experienced the most horrific year possible, you don’t have to deal with stress or mental health issues alone, and neither should you. Take a look at our website, www.rainydaytrust.org.uk or give us a call on 0203 192 0486. We are here to help because we care. 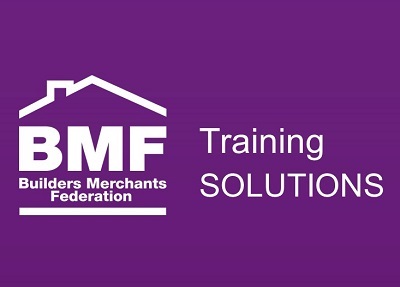 Many BMF Training Courses are equally relevant to our supplier members as well as builders’ merchants. Others are specifically designed for supplier members. For the first time, we have produced a dedicated BMF Supplier Training Prospectus detailing the full range of over 60 training courses available for this member group. The new BMF Supplier Training Prospectus covers training programmes in three key areas, Management & Leadership, Sales and Transport. It also includes a training Roadmap that highlights courses that work well together and charts various paths that will help an individual to progress from an apprenticeship to senior management. Each course is clearly described, outlining the purpose and objectives as well as the staff who would benefit most from its content, and further development opportunities for those attending. Importantly, they are designed to be flexible in the way they can be delivered, with open courses that can be held at regional venues such as the growing number of BMF Regional Centres of Excellence, or delivered “in-company” as a truly bespoke service. Details of the BMF Apprenticeship Plus offer, with options for both smaller companies and larger levy-paying organisations through the BMF’s Apprenticeship Training Agency or its Levy Management Service, are also contained in the Prospectus. To get a copy of the Prospectus or find out more about any aspect of BMF training, contact paige.godsell@bmf.org.uk or on 02456 854980, or click here to view the courses online.